Kinnigoli, Feb 8, 2016 : A pair of wild bulls which have been loitering in Kinnigoli area since the past few days, have terrified locals. It has been gathered that on February 7, Sunday, the bulls were spotted in the hilly area close by the Guttakadu Chamundi Gudi following which locals intimated the Forest Department. The forest personnel who rushed to the spot, though tried to trap the animals by spreading a net, it was a futile exercise as the bulls managed to escape and vanished in the forest. 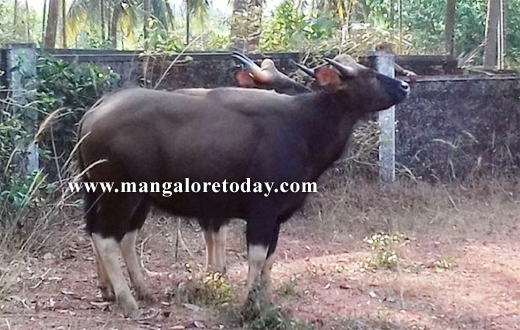 But, they were soon seen in the fields of Guttakadu Gopal Bhandari add later in the evening at Ulepady, Kukkate areas. Forest officials Parameshwar and Prakash were part of the team that tried to trap the wild bulls. As the man has been destroying the forest the wildlife is being Homeless and get to see in the town.